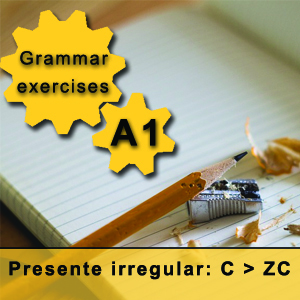 Among the different kinds of Spanish irregular present tense, the one that we are going to study in this free grammar exercise may be the easiest. As you know, there are irregular verbs in Spanish that change one or more letters in the root, and this happens in different persons. 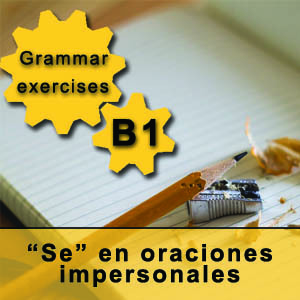 However, the verbs that we will learn today only change one letter of the root in the first person singular. This kind of Spanish irregular present tense changes the letter -c- that appears in its root to a -cz-, but this happens only in the first person singular. The rest of the persons remain completely regular. Bear in mind that this irregularity appears only in the second and third conjugations (that is, in verbs that end in -er and -ir), and it never appears in verbs of the first conjugation (that is, in verbs that end in -ar). That is because the sound of the -c- is different, as you may notice if you pronounce it. In the link above you can download this grammar exercise, where you can find many other verbs with this particularity. The solutions appear below. The exercise was taken from our Spanish grammar book, a practical reference book containing all you need to know about Spanish grammar in easy tables and schemes. It was written and designed by Lola González Martínez, founder of Tilde Madrid Spanish school. We hope you enjoy and learn!